An everyday cake for chocolate lovers. A family favorite! 1. Heat oven to 325 degrees F. Coat two 8 x 2-inch straight-sided round cake pans with nonstick spray; line bottom of pan with waxed paper. Coat waxed paper with spray. Set aside until batter is ready. 2. Mix flour, baking powder and salt in a small bowl. Set aside. 3. With mixer on medium speed, beat butter and granulated sugar in bowl until light. Add egg whites, one at a time, beating well after each addition. 4. On low speed, beat in flour mixture alternately with buttermilk, beating after each addition. Stir in 2/3 cup of the mini chips. Divide batter evenly between prepared pans. Spread level. 5. Bake at 325 degrees F for 37 to 39 minutes, or until cakes spring back when pressed. Cool in pans on a rack for 15 minutes. Invert cakes; remove pans and paper. Turn right side up; cool completely. 6. Place remaining chips (1-1/3 cups) in a glass bowl. Microwave on HIGH 30 seconds and stir. Heat 45 seconds more; stir until smooth. Set aside. In large bowl, beat together confectioners' sugar and heavy cream until blended, 1 minute. Beat in half of the melted chocolate, then remainder. Beat 1 minute, until shiny, smooth and good spreading consistency, scraping down bowl halfway through. 7. 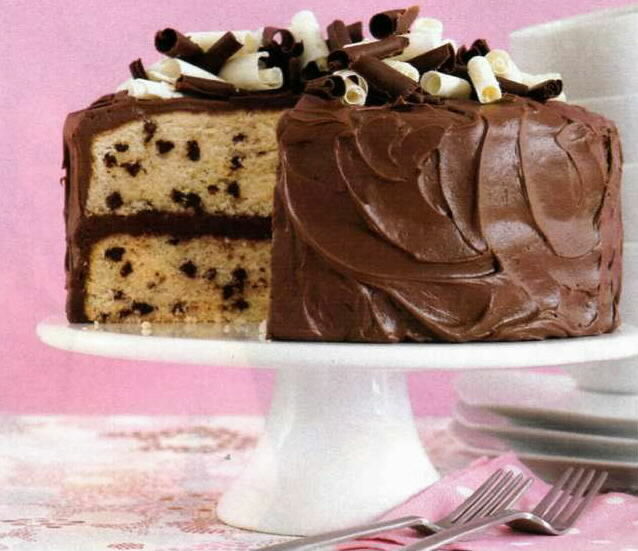 Place one cake layer on a pedestal or platter. Spread with 2/3 cup frosting. Top with second cake layer. Spread side and top of cake with remaining frosting (if frosting becomes stiff, use warm spatula to spread). Garnish with chocolate curls. Use your favorite chocolate icing and viola.... dessert!!! !